The great Texas born guitarist Floyd Dakil sadly passed away this week at the age of 65. 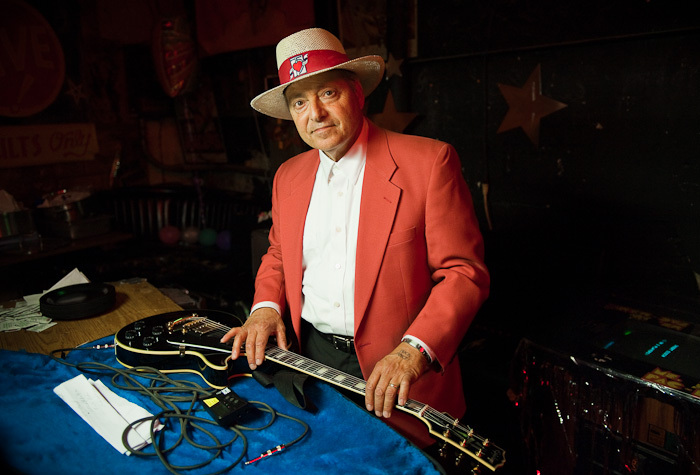 He was scheduled to play the Ponderosa Stomp this fall in New Orleans. I met and photographed him at the Stomp's SXSW Showcase at the Continental Club in 2009. I had no idea what a 'Floyd Dakil' might even look like until I figured out the cleanly dressed man in the orange jacket was him. I approached him outside and asked if I could make a quick portrait and we moved a few feet over to a painted wall near the back stage exit. Later I saw him tuning his guitar by the light of the pool table lamp backstage and just asked him to look up from there. He gave me his business card for his company "FDI Financial Corp." and I sent him some prints when I got back to NYC. His best known recording was "Dance Franny Dance" as the Floyd Dakil Combo, which was amazingly recorded live at the Pit Club in Dallas, TX and released on the Jetstar label and later included on the Pebbles vol. 1 garage rock compilation.